HAVE you been craving for typical Australian wholesome food, with barbecued lamb and beef? 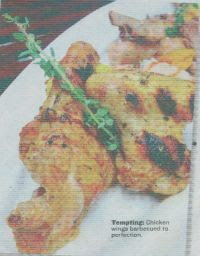 Well, the Crown Plaza Mutiara Kuala Lumpur Planter's Inn restaurant is having the Aussie BBQ every Sunday. It started in April in line with the Australian Month 2009. As you step into the restaurant, you are transported into the land Down Under as the friendly attendants in cowboy hats greet guests with a warm smile. The greens are flesh and the variety is mind boggling. That's not all, try choosing from the array of meat at the carving station. The BBQ station located just outside the restaurant by the poolside has flesh seafood like Salmon steaks, prawns, squids, chicken drumsticks, Bratwurst Sausages and for meat, try lamb chop, Australian Sirloin and Beef medallions. marinate the lamb," said Alham. The grill station offers Grilled Beef Mediterranean Style, Chicken with Lemongrass, Grilled fish fillet with garlic and olive and Lamb Kebabs with onions, mushroom and pepper. The dessert counter has a variety of mouth-watering delectables but two are uniquely Australian, the Pavlova and the Savarin. "Desserts in Australia are usually made with fruits and both Pavlova and Savarin are served," he added. drinking the free flow of drinks like Aussie Bubbly, beer and house pouring wines that come with the buffet. 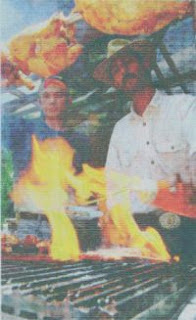 The Aussie BBQ is priced at RMI30++ for the buffet and the flee flow of Aussie Bubbly, beer, wine and spirits. For non-drinkers, the buffet is priced at RM85++. PLANTER'S INN RESTAURANT, Lobbby Level, The Crowne Plaza Mutiara Kuala Lumpur. (Tel: 21482322 ext 3820/3821).